P21S Paintwork Cleanser is a great way to prepare your paint before sealing or waxing. This pure polish helps cleanse the clear coat so it is free from embedded debris and other contamination. Over time contaminates will become lodged in between the micro ridges of the clear coat and they will often not be removed with a simple wash and dry. The contaminates and swirls cause light to not pass directly through the clear coat, which prevents a deep shine. This polish will help remove imperfections, surface contamination, oxidation, old wax and sealant while buffing the paint to a high shine. The Paintwork Cleanser's smooth cream goes on and off very easy and makes a great addition to any detailer's arsenal. 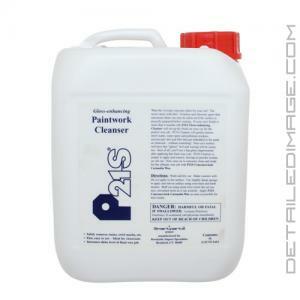 I have been using the P21S Paintwork Cleanser for many years now, and I don't see another product replacing it. Zymol's HD Cleanse is a competing product but I find the P21S cleanser to be the same or better in terms of actual cleansing ability and considering that it's much easier to use, doesn't stain the applicators and also leaves a well prepped finish, the P21S Paintwork Cleanser is an easy choice over any others. Highly recommended for all to try out soon! Directions: Wash and dry car. Shake bottle well. Do not apply to hot surface. Use slightly damp sponge to apply and rub on surface using even back and forth motion. Buff out using clean, soft cloth (a microfiber towel works well). Apply P21S Concours-look Carnauba Wax as soon as possible for best results. very good product. Have used it before and ran out so repurchased. just bought this for the first time. have never really used a chemical polish before, except Klasse AIO. all I can say is that this stuff is amazing. looks like a LSP after using. used in my process to polish my wheels, which are Ro_Ja R2-5 made by Rays. they are the Carbon Black finish, which is the same as the Volk Diamond Black. 1st step is to clay wheels, followed by ScratchX 2.0, followed by Menzerna Final Finish, then I used the P21S where I would normally just glaze and then seal. after the application of P21S the painted surfaces and anodized lips where as smooth, shiny and deep as if I had just applied my LSP. the metallic in the paint really popped and the fine scratches the polishes could not remove were even further diminished. there must be some kind of filler in this product. the wheels are 3 years old and are only used in summer. I take very good care of them, but they are delicate wheels and take some punishment in normal driving. this is the best they have looked since new and I polish and seal them every winter. this product made the difference this year. I have an all white vehicle. I was running down I-95 south one morning going to work when I was struck by a re-tread that came off a Tractor Trailer that left a large black rubber mark on the left side of my front Bumper Cover. I broke out the P21S Cleanser with a foam pad and rubbed it right off and buffed it with a Plush Microfiber towel and I was a good as new and you can't tell that anything have ever happened. I followed up with Menzerna PO106FA and sealed it Klasse Glaze and I was good to go again. I always keep a tube in my vehicle since then. Great stuff to have around at all times. The Germans really knows their stuff.